The best Volvo 740 940 Turbo 1992-98 performance intercooler kit on the market! This BigPack includes both do88 performance intercooler and intercooler pipe kit. This kit is for you with high horsepower goal and wants to upgrade to the absolute best! 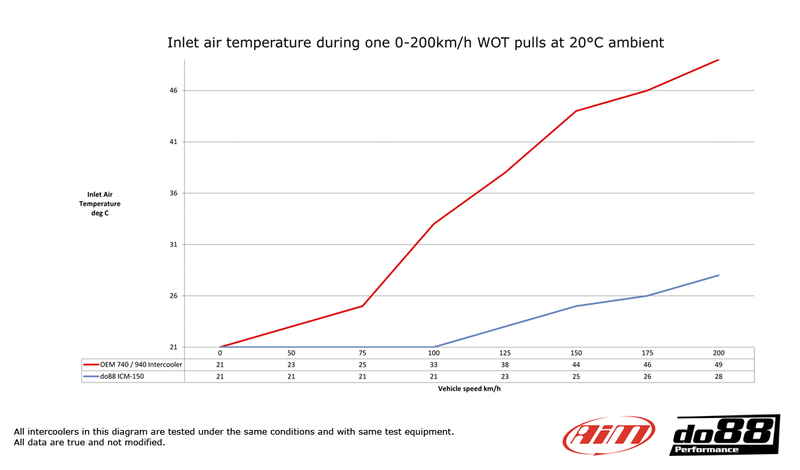 Only changing to our performance intercooler is a Big improvement but together with our pressure pipe kit the improvement is Huge! 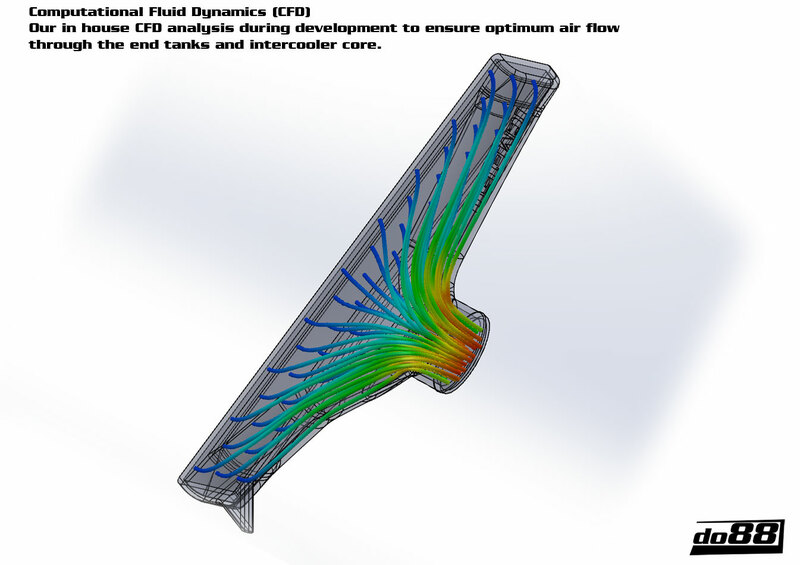 Our pressure pipes has better airflow than the stock pipes, this we have verified in several tests both in car and in our own SuperFlow SF-1020 flow bench. - Core volume: 13945m3 (8465cm3), do88 is 65% larger! 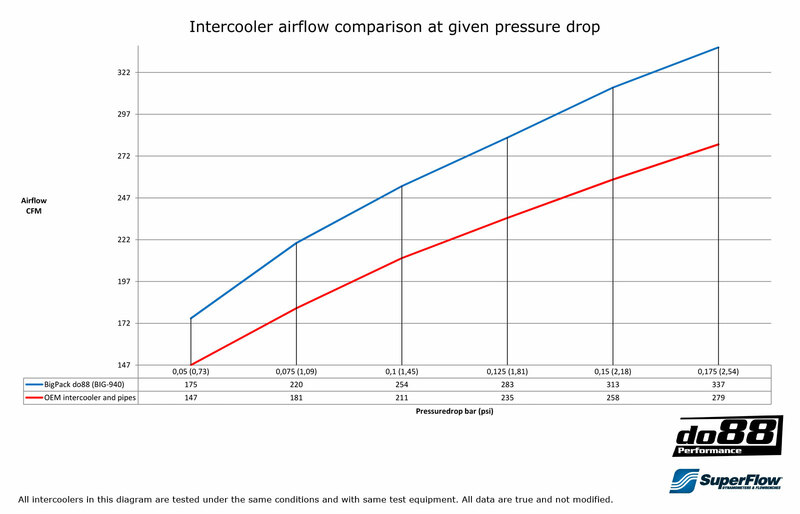 - Air flow at 0,15bar/2,18psi pressure drop: 313CFM (258CFM), do88 21% higher! because of the increased thickness. There are no predrilled holes for the AC-condenser, these holes needs to be drilled (easy to do). BigPack includes a full aluminum performance intercooler and a complete 2,5" pipe kit and silicone hoses. This BigPack replaces everything between the turbo outlet and the throttle body this why it drastically improves the airflow / cooling performance compared to the original. The pressure pipes are manufactured in 2,5" mandrel bent aluminum pipes. Custom made high quality silicone hoses with 4 layers of polyester/aramid reinforcement. These hoses can handle very high temperature and pressure! Always remember that the OEM intercooler was designed for the power level the car was built for and a power increase or even very hard use of the car in a standard version may cause that the OEM intercooler don't have the performance you need. So only after engine software tune do88 BigPack will give a performance increase over the OEM intercooler! do88 BigPack comes with all hardware necessary for installation. Three different hose colors are avalible Blue / Black / Red. There are no performance difference between the different colors, choose which color you think will be best for your car. "63mm Standard" if you have the original throttle body on your car. "76mm ( 3inch )" if you have switched to a 3 inch throttle body .